When a last blast of winter walloped Sisters with over 30 inches of snow in some areas last week, it made for treacherous driving conditions, and had some folks homebound. Snow may be beautiful to look at, but it can certainly make a mess out of traveling back and forth to work. Many people had been hitting the snow-packed roads with cross country skis, but if you wanted to get somewhere faster, for some - mushing was the way to go. 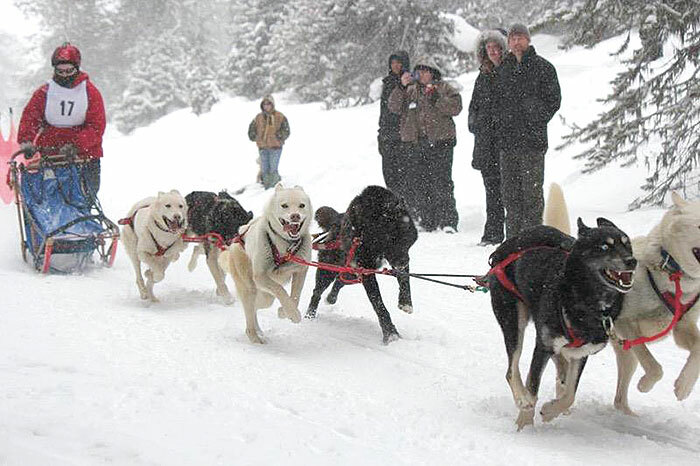 Mushing is a sport or transport technique powered by dogs. The practice of using dogs to pull sleds dates to 2000 BC, and it was the right strategy to get around for Dr. Kelly Barton, veterinarian associate at Sisters Veterinary Clinic. Barton is a dog musher both recreationally and competitively. During Barton's trek to work last week she had to break trail with snowshoes for over a mile to reach the highway. "The snow was too deep for a single sled dog to drag a sled with a person on it," Barton said. "It was also too deep to drive my small SUV out, which is what precipitated this whole event." Barton noted, "Once my dog Wing and I got to the highway, I took the snowshoes off and put them in my sled. Then we worked together to drive two and a half miles to Sisters Veterinary Clinic for work that day. Wing was a trouper and got me to work on time. He is trained to stay to the right side of the road/trail, so we were generally on the shoulder of the road but did have to go to the other side when the plow came through just on the edge of town." Barton joined Sisters Veterinary Clinic in November of 2018. She earned her Bachelor of Science at Oregon State University (OSU) in Zoology, her Doctor of Veterinary Medicine at Ross University in the West Indies, and completed her clinical year at Iowa State University. Barton began mushing as a hobby in 2006 with her now-retired 17-year-old Lab mix Sasha. After moving to Oregon in 2008 as an undergraduate student at OSU, she apprenticed under Karen Yeargain to learn about sled dogs. Yeargain, experienced musher, instructor, Mush Without Slush founder and founder of Tumnatki Siberians, has been raising and training sled dogs for over 28 years. "I first met Kelly at a sled dog race outside of Yosemite in 2009," Yeargain said. "She came over to my truck, full of Siberian huskies, and asked if she could help me for the weekend. She learned about hot-waxing sled runners, and on the second day, her role shifted, and she was the one teaching new mushers the tricks of waxing!" "Six months later she called out of the blue and asked if she could stop by my kennel in Prineville on the weekends to help out." Over the course of the next few years, Barton learned how to manage a kennel, assess sled dog form and function, set training schedules, maintain good nutrition, and how to properly drive a sled team. Barton noted, "Karen permitted me to compete with her dogs that we trained together from 2009-2015." Barton has participated in mushing races as short as a two-dog couple-mile scooter race to eight-dog 25-mile races and even a three-day, 75-mile race one year. "When not racing with them, we spent a lot of time training and conditioning the dogs and would take a dog team camping from time to time," Yeargain said. Between 2015 and 2018, Barton attended veterinary school at Ross University School of Veterinary Medicine. Upon graduation, she resumed training with Yeargain and her current dog team, recently competing at the Diamond Lake sled dog race. "Last weekend, I offered Kelly my main race dogs to compete in the Diamond Lake Sled Dog Race at Diamond Lake, Oregon. Conditions were tough but Kelly ran the team well and took first place in the 6-dog 15-mile class," Yeargain said. Barton has two Siberian huskies out of Yeargain's kennel, Larka, a four-month-old puppy and her 8-year-old lead dog, Wingman (aka Wing). "I chose dog mushing as my sport and veterinary medicine as my profession for similar reasons," said Barton. "I love the human-animal bond and watching how that develops over time through life's ups and downs. In the case of dog sledding, that relationship is incredibly close, as the dogs are frequently your mode of transportation through remote wilderness. They rely on you to take care of them and you rely on them to get you here and there safely. I see that deep bond with many of the clients and patients that frequent the clinic as well and am happy to help both sides of the relationship as much as I can." In veterinary medicine, Barton is particularly fond of client education to help pet owners make the best-informed decisions for their pets' needs. "I became a vet primarily for these reasons and am very excited to get to know the people of Sisters and their pets!" Yeargain added, "Over the years, Kelly became my most consistent and adept mushing student. Her skills as a musher and sled-dog racer have gained her a reputation in the sport that is one of being a good dog person and a mentor to others in her own right."